A gig on Friday the 13th!! I foresaw disasters of an electrical nature, bum notes, wardrobe malfunctions, problems aplenty. But not a bit of it. The Flowerpot faithful were very much in luck as Britain's premier tribute band to the world's number one punk band act put on a tremendous show. These boys really know what they are doing. To choose "American Idiot" and "Holiday" as your opening two numbers and performing them brilliantly puts you in an immediate position of power. And that's exactly what they did. Game over from then on with Derby there for the taking. 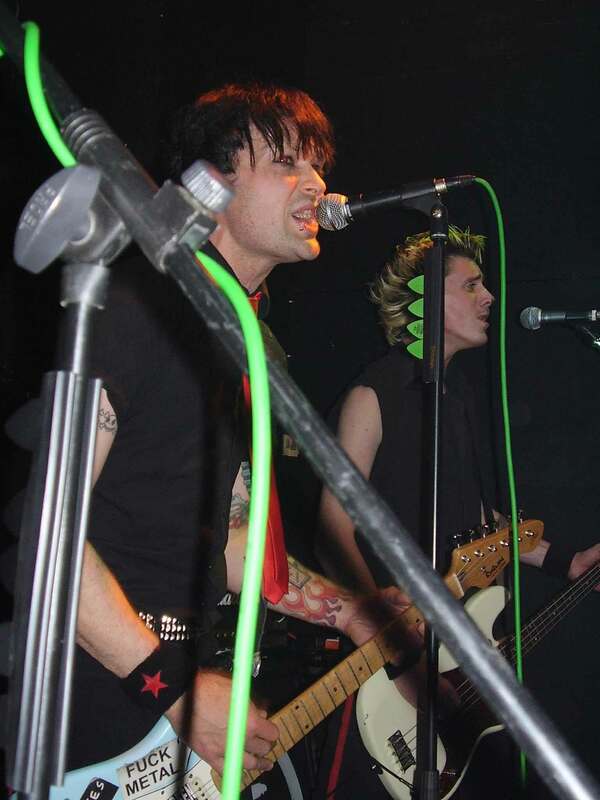 Having laid down his political agenda, Jay Stone as Billie Joe Armstrong then proceeded to hammer out the band's "Dookie", "Insomniac" and "Nimrod", teenage angst tracks with the densely-packed crowd pointing, shouting and singing along in the right places. Paul Marshall as bassist Mike Dirnt had all the poses and punkish gurning off to a tee and combined excellently with the thunderous Tre Cool drumming of Dave Bittlestone. The mortar in the G.D. wall of sound was provided by the oft-forgotten but most important James Agnew as fourth man Jason White, punctuating his solid strumming with some nifty, spot on guitar solos. "King For A Day", with Billie dressed as King William I of America (watch out George W.?! ), a belting "Basket Case", a fist-pumping sing/shout-along of "Minority" and a set-concluding version of "Time Of Your Life" were for me probably the highest of peaks in what was a Himalayan performance all night anyway. We took the time to listen to them whine and it was most entertaining. Lads - you rock.